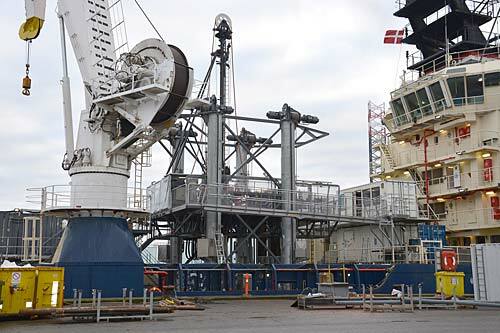 Newly launched multipurpose drill ship Freja integrates a high-performance active heave compensated drilling platform manufactured by MacArtney. The drilling setup on board the vessel has been designed to provide enhanced drilling conditions even in rough seas. A customised, motion-compensated working platform of ten times seven metres is situated amidships. This means that the working deck remains stationary while the vessel follows the movements of the waves. Besides, the platform design includes a roll function compensating for the vessel rolls by ±7 degrees. The active heave compensation is achieved by four fast reacting, high performance winches mounted on the corner pillars supporting the entire platform. The winches are controlled by an integrated control system, which ensures that the complete platform is synchronised with the vessel dynamic positioning control system. This enables drilling methods which ensure higher sample quality than that usually achieved carrying out traditional drill ship procedures. This way, the operation remains less dependent on the weather conditions. In addition to project management, mechanical design and engineering, as well as installation and commissioning, the scope of supply of this MacArtney turnkey solution includes the 100-tonne AHC drilling platform, four winches, the integrated control system and a spare package comprising among others three spare winches. The main purpose of this system is within offshore wind projects. “We are extremely happy to be part of this project and in a position to supply such a leading-edge system solution enhancing our customer’s drilling methods to the benefit of all,” states Søren Hartvigsen, Technical Director of MacArtney Manufacturing.